A gong sounds somewhere in the distance, and in the silence that ensues the reverberations of the collective conscience precipitate a collage of impressions that are at once familiar, and yet far beyond the accepted structures of perception. In this impressive collection of contemporary haiku, Ban'ya Natsuishi expertly challenges and coaxes the reader to join him in a flight of fancy - in and out of reality and illusion - not so unlike the great surrealist Salvador Dali. A gong sounds somewhere in the distance, and in the silence that ensues the reverberations of the collective conscience precipitate a collage of impressions that are at once familiar, and yet far beyond the accepted structures of perception. In this impressive collection of contemporary haiku, Ban'ya Natsuishi expertly challenges and coaxes the reader to join him in a flight of fancy - in and out of reality and illusion - not so unlike the great surrealist Salvador Dali. Both the reader and the flying pope take to the air, suspended above the Earth like an out-of-body experience ... observing from afar, and yet experiencing the dream-like state as if it were totally real - as a sort of déjà vu recollection of the fringes between zazen and newspaper headlines ... or perhaps the CNN rolling news texts, floating across the bottom of the television screen. While it may be tempting to point out Natsuishi as l'Enfant terrible of contemporary haiku writing, his impudence is not intended to shock. It is, in fact, this sense of detachment in the author that binds together the childlike, the serious, the sarcastic, the humorous and the reflective - resulting in a splattering of surrealistic images that pose far more questions to the reader than give blatant commentary. 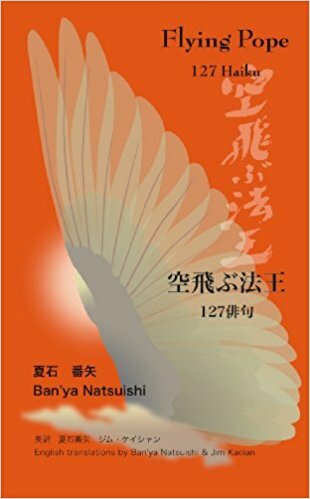 Because of the masterly free flying construction, the reader is just as easily won over to the haiku of Ban'ya Natsuishi as he/she might be to adventuresome comic books and animated films. Do read this book several times - forward and backwards, and even starting in the middle and proceeding in any direction ... sometimes dancing back and forth. There are many hidden levels within the poems, the silent connections in between the poems and in the work as a whole. (based upon the English version of "Flying Pope").